On Monday, March 26th many of the Commonwealth's deaf and blind citizens, their friends and family, and deaf-blind advocates came to the Massachusetts State House to showcase some of the critical services provided by organizations and agencies to children and adults in the deaf-blind community. 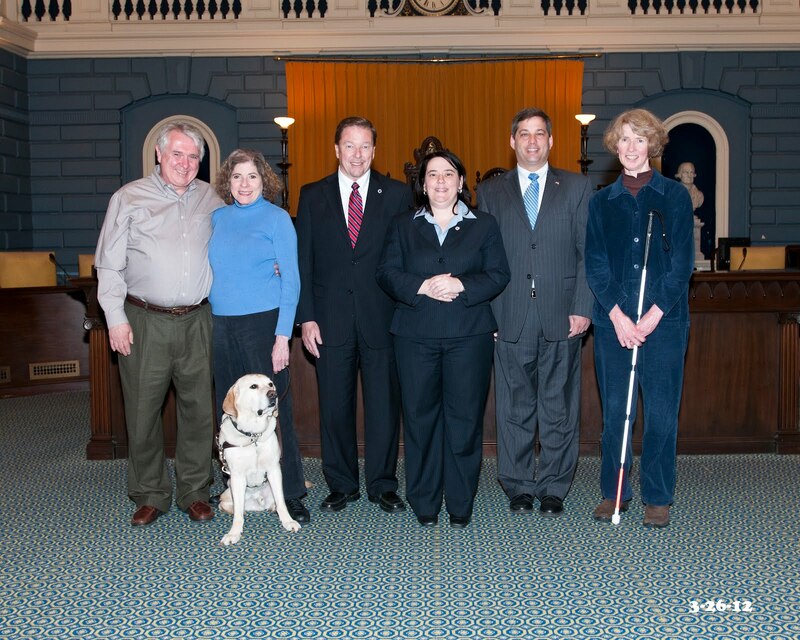 I was honored to meet a few constituents from Gloucester, MA, including Charlie and Janet Marcous and their service dog William, and Jean Healy. We discussed the many issues the deaf-blind community face on a daily basis. They provided me with an informative perspective and I am glad to have had the opportunity to have learned from them. To learn about some of the resources available and ways that you can make a difference please visit the DeafBlind Community Access Network (DBCAN) website by clicking here. Below is a picture posted from our visit. * Charlie and Janet Marcous and their dog William, Senator Richard Ross, Representative Ann-Margaret Ferrente, Senator Bruce Tarr, and Jean Healy.